Though the Wii has brought video games back into my life to a degree, I don’t play them as much as I used to. As you may have already realized, however, I do spend some time thinking back on the old titles I played and, even more often, the ones I played repeatedly. Wikipedia serves as an endless source of nostalgia for these bygone games, offering little reminders of my childhood with whatever details the articles’ writers deem encyclopedic enough. (“That’s right. Link did have to use the hammer to knock down the trees that hid New Kasuto, the predecessor to which had been reduced to a ghost town, literally. What fun!”) I occasionally write about these old memories, but only when I can justify it somehow — by tying a game to some obscure bit of trivia, like I did with Teresa and the Hopping Chinese Zombies, or by putting the game in the context of wistfulness for my own childhood, like I did with “Messages From Sahasrahla.” Somehow, I feel guilty about remembering just for the sake of remembering — not so much because I worry that you the reader might find unjustified nostalgia less interesting, but more that I feel I have to make it matter. Video games, viewed as such, don’t matter all that much to most people, maybe because they truly are just silly toys or maybe because most people haven’t given them the thought I have. Consider this all, then, a prologue for what I’ll discuss in the below paragraphs and, retroactively, as an explanation for every other rant on the bytes and sprites that I’ve duped you into reading here. Drop any associations you might have about the words “final” and “fantasy” used in conjunction. (Especially if your immediate association is Own Pallett’s pre-Arcade Fire project, which, by the way, is named after the video game series) Though the series has proved monumentally popular since its debut in 1987, most people haven’t played any of the twelve full-fledged Final Fantasy installments so far, and that includes even you geek-savvy Back of the Cereal Box readers, I’d wager. A quick explanation: For the most part, the Final Fantasy games exist independently of each other, with each sequel taking place on a world with a unique geography and history. Some games, especially early ones, skew medieval, some futuristic, some into an alternate past where the mechanical technology includes innovations that it shouldn't have yet. 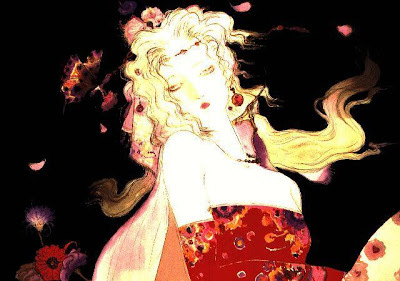 My favorite, by far, was Final Fantasy 6, which is often known as Final Fantasy VI or, due to the fact that these games appeared in the United States in a different order than they did in their native Japan, Final Fantasy 3. To anyone who played and truly appreciated the game, Final Fantasy 6 likely represents a pinnacle of sorts for the 16-bit age of gaming. It offered a rather comprehensive storyline that seemed downright epic when I first played it in late 1994. (In retrospect, the travails of its twelve main characters strike me as a little hokey and maudlin. This could very well stem from the fact that the game’s plot was not written for an American audience, in which case I suppose I should be less judgmental.) Perhaps what helps the game stand the test of time nonetheless, I feel, is the fact that it has no genuinely central character despite having a single cohesive plot. The creators tell the story through the interactions of many different protagonists, each with his or her personal cast of supporting players. These individual stories slowly evolve into a central struggle. No mean feat, I’d say, even for a work of literature. The game’s story falls short of any true literary greatness, but for a video game and for something played by 12-year-old me, it was pretty engrossing. The point of this all — and my chance to demonstrate how my Latin training paid off, as I look back on the game as a piece of text, written and then re-written in a different language — is that the significance of certain words chosen actually lent Final Fantasy 6 a deeper meaning than I realized as a kid. Remember when I said the game lacked a true central character? That’s still true, but two characters come closer to being the main protagonists than any others. They also happen to both be female — a relative rarity, both for the Final Fantasy series and for video games in general during the time this one came out. The game is divided into two distinct halves: the first in which the heroes attempt to thwart the villain from accomplishing something dreadful, and the second, which takes place one year later, after the dreadful thing has happened and has drastically changed the world for the worse. The first half begins focused around Terra, a young woman who cannot remember who her own past. Her gradual discovery of where she came from probably constitutes the first half’s most important plot thread. It drives a lot of the action. In the second half, the player begins as Celes, a supporting character from the game’s first half who gradually reunites the heroes to finally defeat the megalomaniac who caused the world to fall into its less-than-happy state in the first place. Aside from the obvious parallels between Terra and Celes — both are only 18 years old at the story’s beginning, both exhibit paranormal abilities that initially set them apart from the rest of the game’s human population, and both begin the story in the service of the story’s villain — their very names suggest their nature as complementary components. Terra’s name, of course, comes directly from the Latin word for “earth,” while Celes’s would seem to suggest a truncated form of the name “Celeste,” which comes from caelestis, meaning “heavenly.” This merits notice not only because earth and sky carry symbolic significance as elements of the natural world, but also because the game itself takes place on the ground, as characters trot about the landscape, and in sky, as airships and a floating island figure heavily into the plot. (Had there been a third segment and had the game featured the sea as a significant setting, I would have bet its start-off character would have been named “Marin” or “Maria.” In fact, the game mentions an unseen character named Maria, a much-discussed opera diva, whose dead-on resemblance to Celes serves as a pivotal plot point in the game’s first half.) One of the theories that a beloved English professor once espoused (as have surely countless others in the profession) is that good fiction does not feature arbitrarily named characters, and for years I’d like to assume that this sort of planning went into Final Fantasy 6. However, to assume it happened on the Japanese end of things would be incorrect, I eventually learned. However appropriate the symbolism that Terra and Celes’s names might imply, it can only be attributed to Ted Woolsey, an American and a longtime video game translator who has drawn some criticism for taking liberties with the original texts. (Others, however, defend him for doing a good job, given the constraints. More on those in a moment.) In the original Japanese, Terra is “Tina,” named so by her Japanese creators allegedly because the name sounds more strange and exotic to Japanese ears. Celes is still technically “Celes,” but her name could have been translated just as easily into English as “Ceres,” the name of the Roman goddess of the harvest. In that case, I’d guess her first name is pronounced less like the last name of the tennis player Monica Seles and more like a rhyme for “puh-leez.” Not only does it grate on the ears, but it blows my whole theory to linguistic smithereens. Further evidence against my theory about the connection being important to the characters’ inceptions lies in the name of another character, Strago, a wizened old sage whose name in the Japanese version is “Stragus,” making his full name “Stragus Magus” — literally “wizard wizard.” (A stretch, I guess, but a translation that’s rooted in good standing. The Italian verb strego means “I bewitch,” a form of the verb stregare, and strega means “witch.” Stragus therefore seems like a reasonable masculine approximate, especially when you consider that it was filtered through Japanese. Magus is defined in English simply as “magician” or “sorcerer.” Thus, “wizard wizard.”) One of the technical hardships of translating character names from Japanese stems from the fact that the symbols that constitute written Japanese pack in a lot more linguistic info than do the letters of the Roman alphabet. As a result, the original Japanese game may only allot a certain number of spaces to fit names that, for the game’s original language, would have been more than enough. Once translated, however, the original names may not fit, leaving translators to either change the name or fiddle with the internal workings of the game to allow for more letters. (A good example of translators choosing the former: The game Chrono Trigger only allowed for five-letter names, leaving the protagonist’s name “Crono,” despite the fact that the game’s title used the correct spelling, “Chrono.” Different complications may arise as well. A prominent character in Final Fantasy 4, for example, is known as “Rydia,” despite the existence of the far more common name “Lydia.”) In Final Fantasy 6, this fate befell Stragus and gave him his slightly altered American name, Strago. We already know how Tina became “Terra,” but I initially wondered if this sort of truncation could have resulted in Celes being chopped back from “Celeste.” Nope. “Celes” is officially translated as such, regardless of where she’s being appreciated. Thus, it would seem as though the “earth vs. sky” notion was never originally intended to apply to the two characters. I have to assume, then, that the metaphoric parallel the English version of the game introduces is unique, whether by design or by accident, and that we English-speakers were lucky to play through a version of the game with such a subtle but effective literary element. Strange, though, to think that it happened after-the-fact and possibly as a result of a total accident. I appreciate it, regardless, perhaps all the more so because it resulted from a translation upon a translation, and anyone who lend literary weight to words twice-translated has done well in my book. I like that I can approach content from a video game in this fashion, but also that such content can even make me think about the creators’ intentions and symbolism and language and meaning in a way that would more often be reserved for film or art or literature. So there you have it: more pointless video game nostalgia that I’ve attempted to make seem like less of a waste of your time with the addition of context. Did I elevate it? Did I just lower myself? Will I ever have the guts to wax nostalgic on my own blog just for the sheer joy of remembering things that once made me happy? I keep coming across crap that makes me think: "This seems like something Drew would like." Thanks! These are pretty good, especially the ghost scrolls. Do you mean that the software had a say a 4 character limit for names, where "character" includes "kanji" or "kana" or "Roman letter", so the English translator had to come up with new 4 letter names? That's interesting. Yes, that’s exactly it. This realization marked one of the first times I ever truly appreciated that not every language works like English does. Thinking about this actually got me interested in linguistics in the first place. It’s interesting to me to see how translators worked around this problem: With names, for example, they’d either have to approximate whatever could fit in the given space (“Strago” instead of “Stragus,” or in Chrono Cross, a character named “Lucianna” being renamed “Lutina”) or just say “to hell with it” and rename them entirely (Final Fantasy IV character “Gilbart” being named “Edward.”) The problem of space allotments in translating from Japanese affects more than just names. Many diehards bemoan the additional plot development that some games have in the original Japanese but which just can’t fit in the English version. And one game --- Seiken Densetsu 3, which should have been released in the U.S. as Secret of Mana 2 --- never made it stateside, with one of the factors in that decision being that the Japanese version of the game truly stretched the limits of what programmers could do with a cartridge for a 16-bit video game system. To fully translate all that text, according to some, would have pushed the total information stored on that cartridge over the maximum. As a result, the game has never been translated officially. There were other factors, too, but I’ve always thought it was interesting that a fundamental problem was posed by the differences between written English and written Japanese, with the latter being more efficient, in a sense, than the former. while that's true (or at least i've heard it is) you should probably also note that it's generally not an issue anymore (or at least i've heard that it isn't). now video games are CD-based and able to store a lot more information, so the extra space needed for english isn't a problem so much. also, when the character space limit presents a problem, they're more likely now to just change that limit to whatever is needed to fit the correct version of the names. but i'm not sure why they failed to do that for chrono cross. As a major fan of this game (borderlining hysteria) I definitely appreciate seeing an article about it. This game is often overlooked in regards for later games in the series which focused on cinematic cutscenes and graphical prerenders rather than text to tell the story. One thing I'd like to say though - while it may be true that there was no intent to centralize Celes/Terra or make them representative of Earth/Sky, one could easily draw that conclusion. When we play games like this, or read stories or watch movies that have somewhat ambiguous themes, we tend to like them more as we're able to make them our own - we can implant a part of our own design into the story to have it speak to us. So what if it was never intended? Terra's element of fire could easily be tied with the deep earth, while Celes's element of ice could be drawn to the harsh freezing upper atmosphere, or even outer space itself. Games like these encourage imagination, and there's no reason to squash your own ideas just because they're non-canon. Play the game for you, not for anyone else.